Trump trashed U.S. intelligence and law enforcement while standing beside Russia’s leader. When asked point-blank whether he believed his own intelligence community or Putin about the election hacking, Trump replied: “I have real confidence in my intelligence people, but I must tell you that President Putin was extremely strong and powerful in his denial.” He then went on to make clear, at some length, that he did not trust the conclusions of U.S. intelligence or law enforcement, raising a series of red-herring questions popular on the right about servers and — of course! — Hillary Clinton’s emails. Expressions of shock trickled out slowly from serving officials watching the speech, and former CIA director John Brennan accused Trump of treason. This matters in a global sense because it gives governments and other actors everywhere license, when presented with a U.S. indictment, legal judgment, or request for cooperation, to dismiss it with an airy “fake news.” It specifically communicates to Putin that he needn’t worry about the U.S. Executive branch gearing up new sanctions or intelligence responses to the indictments. And it is a devastating repudiation of the commitment of tens of thousands of Americans who work for these parts of the government. Will there be any blowback from that in our domestic politics? We may yet see a string of resignations from career officials. But in the hours after the summit, elected Republicans were missing in action when it came to defending the law-enforcement professionals whose support they love to tout. Putin kept the power plays low-key. Sure, he showed up late — his plane touched down about when the meetings had been scheduled to start. It likely was no accident that the first question came from a Russian reporter challenging Trump on his comments about the Russian gas pipeline to Germany. And his deft production of a soccer ball at the final press conference — “Mr. President, the ball’s in your court” — was a stinging reminder to insiders who remember the “reset button” Hillary Clinton presented Foreign Minister Lavrov. But Putin avoided humiliating Trump, at least publicly. The world got to see Putin’s vision of himself as a top leader. In the Russian view, this is where the country’s leaders belong; on a par with the U.S. and China, treated with respect, showing leadership in solving global problems. Putin’s long opening statement at the press conference distilled these aspirations — from taking up again the mantle of nuclear arms control, to praising “progress” on the Korean peninsula, to gently chiding Trump for backing out of the Iran deal. 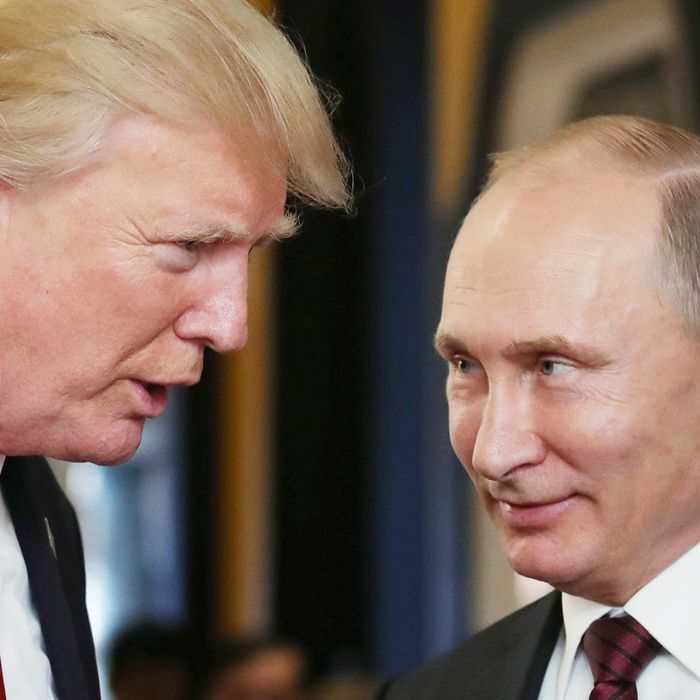 Putin showed magnanimity on a couple of Trump’s core political interests — North Korea, and also positive rhetoric on maintaining Israel’s security in light of recent incursions along its Syrian border. When Trump was asked about his criticism of German gas purchases from Russia, Putin jumped in to propose that the U.S. and Russia together manage natural gas prices worldwide — an arrangement that would accord Russia the energy superpower status that its poor infrastructure has undermined. And when Trump slid into digressions on his electoral victory, and hacking allegations that are completely unintelligible to anyone who isn’t a U.S. politics junkie, Putin looked … presidential. It was a good day for the far right. Each leader offered a dog whistle to their most extreme supporters, in the U.S., Russia and across Europe. While much of Trump’s opening statement read like a greatest-hits-of-realist-foreign-policy, with references to shared history and the importance of talking through differences, the Q&A veered into endorsing far-right conspiracy theories about the 2016 hacking (“where are the servers?”) before ending with an ad hominem attack on former FBI agent Peter Strzok. Meanwhile, Putin gratuitously tossed a mention of George Soros (a favorite whipping boy for far-right anti-Semites) into a comment on U.S. politics. The interplay of references points to a different kind of international cooperation, of which both Trump and Putin are aware — the extensive links among U.S., European and Russian far-right groups, and their shared worldview. Putin came prepared with a counter-offensive to the Mueller indictments. His proposal that the United States set up a joint working group on cyberespionage, co-interview Russian personnel, and add to that an investigation of Americans who Moscow alleges has harmed it, was vintage Soviet counterintelligence. It seems to proceed from a foundation of cooperation, which is what we all want, right? It muddies the waters by putting an alleged Russian intelligence operation on the same level as Russian allegations of financial malfeasance against a businessman, Bill Browder, who is also a pungent critic of Putin’s regime. Were Washington to agree, Moscow would gain the opportunity to learn how Mueller accessed the details of Russian intelligence operations in the indictment, quite possibly compromising sources and methods. And if Washington refuses, the U.S. is the one being uncooperative. Putin still may have overplayed his hand. The Russian leader’s initial statement was calm, even brazen, on the 2016 allegations. He could have left it there, especially with Trump defending him, but he came back to the mic for a long, angry, rapid-fire response that left the interpreter stumbling for metaphors. That may have been Putin’s one misstep of the day — but it’s unlikely to be shown inside Russia. Oh, and Putin made no commitments at all at the summit … The bits of good news from the summit — restarting nuclear arms talks, re-committing to security around the Syrian-Israeli border — evaporate fast on closer inspection. Putin touted the nuclear arms agenda, but Trump scarcely mentioned it. John Bolton in particular has long been an opponent of arms control, and Secretary of State Mike Pompeo is also on record in favor of expanding the nuclear arsenal. So as much as extending the New START Treaty — and sorting out alleged violations of the Intermediate Nuclear Forces Treaty governing smaller weapons — would be popular in the U.S., don’t hold your breath for detailed policy proposals. And when a reporter point-blank asked what specifics the two had agreed on about Syria, he got no answer at all from Trump. For those hoping for a restatement of U.S. commitment to Europe, and to Ukrainian sovereignty, in public, at least, the only discussion of Ukraine was as a transit route for gas between Russia and Germany —while NATO was not mentioned. It is always better, as Putin said, for leaders to communicate. But the positives communicated today seem likely to vanish quickly; while the messages of disdain for U.S. institutions, laws, and norms seem likely to endure — and cause lasting damage.